Description: Emergency micro USB and lightening connectors. Cable specs: USB to Micro USB, charging only. 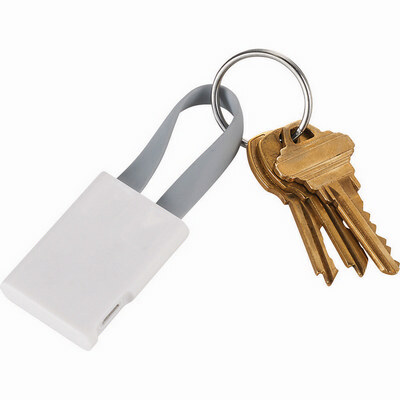 Features: The MFI Certified Tag Cable doubles as a key ring. The detachable Micro USB to USB charging cable can charge your Android devices or simply add the MFI Certified Lightning Tip to charge your Apple Devices. Packaging: Polybag. Colour: White Material: ABS Plastic case with PE cable Product Size: 30mm(w) x 44mm(h) x 9mm(d). Freight details : 200 per carton, 3kgs, 39 x 28 x 14cms; Decoration Type(s): Colour Print / Full Colour Print. Decoration Area: 30mm(w) x 20mm(h). Price includes : 1 Colour Print. Setup is included.